Provenance: .................in the collection of Thomas Viscount Anson of Shugborough (later, 1892, 3rd Earl of Lichfield, 1856-1918) before 1874. There is a dated ownership inscription on the rear of the original canvas. George Smith was one of three brothers who were all artists in their native town of Chichester in the mid-18th century, and amongst the first native practitioners of the pure landscape. Their style derives ultimately from the exemplars of Claude Lorraine, but with a curiously English air. They enjoyed a great popularity during the third quarter of the 18th century. Of the three George, was the most prolific and successful, and exhibited frequently at the annual exhibitions of the Society of Artists from 1760 until two years before his death, in Chichester, in 1776..
George's elder brother William (1707-1764) had been sent by the Duke of Richmond to London to train at the St. Martin's Lane Academy as a portraitist in c.1725. He was joined by George, his younger brother, three years later c.1728 where he was instructed in painting. In about 1730, the two brothers were invited by the Sir John Guise 3rd bart. to come to Gloucestershire to paint. They remained in the county for some eight or nine years, painting a variety of pictures including an altarpiece for the Guise chapel at his house Elmore (destroyed). Sir John presumably took advice on his choice of painters from his cousin General John Guise, soldier and connoisseur, who own the splendid collection of Old Masters is now at Christ Church college, Oxford. At some point around 1740, George returned to his native Chichester, and like his brother, was encouraged by the 2nd Duke of Richmond (1701-1750) and subsequently by his son Charles, 3rd Duke (1735-1806), the collector and developer of Goodwood. From this date on he painted a long series of rural landscapes in a highly refined and technically advanced style, where the “finish” was dependent on the careful accretion of subtly-toned glazes. There was an active market for his pictures, which were occasionally painted in collaboration with his younger brother John after the death of William in 1764. For some years George Smith maintained a studio in London, though his paintings seem always to be inspired by his native Arun Valley. The development of the Society of Arts from 1758 led to the introduction in 1760 of a prize (“premium”) of the substantial sum of £50 for the best landscape painted in England in that year of a size 40 x 50 inches. The Duke was an enthusiastic supporter of the SA, though it is doubtful that his influence was paramount in the awarding of the prize to George Smith: the selection of the winner was by ballot on 1st April 1760, and the name of the artist was kept secret from the voters to ensure fairness. The landscapes by George and his brother were neck-and-neck in the voting, the award finally going to George on the casting vote of the chairman Thomas Brand. The winning picture was then exhibited in the Society's new Great Room in the Strand, where it hung in company with Richard Wilson's Destruction of the Children of Niobe. George again won the premium the following year in 1761; his brother John won the next year and George once more in 1762. They were then disqualified from exhibiting, according to the rules, in subsequent years. Their reputation in London thus established, the brothers returned to their native Chichester, which was experiencing a economic expansion in what were prosperous years, and many paintings were sold to successful tradesman – encouraged, no doubt, by the Duke's example. In 1767, a large landscape was priced at 40 guineas; a small picture was 7 guineas. 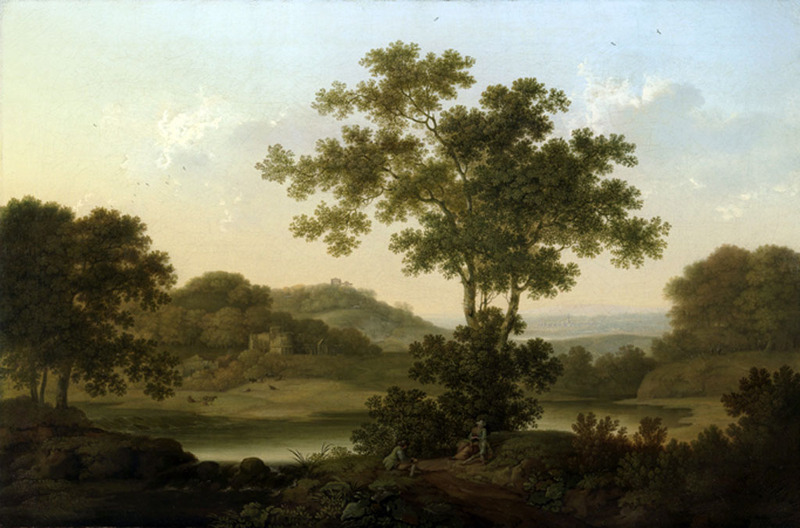 Gainsborough was receiving similar amounts for landscapes at the time. Lady Sarah Lennox noted the prices George's paintings were fetching after his death in 1776: she reports that the pictures were selling “at a little higher price than they did”, but predicted that they would soon move higher still. She quotes the “large finished pictures” at £60, £40, £30 and £20, but she was still interested in buying the “unfinish't” sketches remaining in his studio. Smith's critical reputation was at its apogee in the 1760's, and after his death his work fell slowly into first neglect and then obscurity. His first premium painting for which he received 50 guineas was sold in Christies on 10th February 1838 for just 20 guineas. His reputation was revived only in the 1980's when the seminal exhibition at the Pallant House Gallery in Chichester once more drew attention to the masterful technique and gentle observation that typifies his work, which remains at a consistent and high standard throughout his career. They are appreciated today for their pastoral charm and picturesquely English idiom.